Since the people who live in the Mediterranean basin live to a particularly old age and are immune from degenerative e diseases, researchers and scientists have studied the inherent qualities of the staples of their diet, which is aptly called ‘Mediterranean diet’. Research actually showed that olive oil, which is contained in most dishes, is especially rich in monounsaturated acid fats, and is therefore particularly useful to prevent and fight hypercholesterolaemia and atherosclerosis. The composition of the fat acids of extra-virgin olive oil actually seems to be very similar to human milk, so it can be one of children’s very first foods after weaning. Fish, especially anchovies, sardines and mackerel, are rich in substances that promote HDL or High-Density Lipoproteins (the so-called ‘good cholesterol’ which keeps arteries clean and fights the other harmful cholesterol types) and in addition it is easily digestible and rich in high-quality proteins. Pasta, another staple, and other complex carbohydrates supply energy and, if served with proper sauces, are not fattening. Interesting is the traditional use of wild plants typical of each area. Wild plants, if picked away from industries, houses, roads and farmlands, are ‘organic’ by nature, i.e. comparatively lacking in unwanted residues; in addition, they are particularly rich in nutrients, such as, for instance, mineral salts and trace elements in which the other plants are now deficient. The aromatic plants living all over the scrub are also widely used, and, as well as making dishes tastier and more digestible, they can be used in the place of salt and fat sauces, excessive quantities of which are bad for the health. 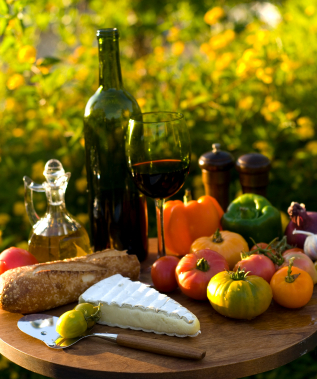 Finally, fruits and vegetables contain a whole pharmacopoeia, which is being slowly discovered and promoted to prevent a large number of diseases, and wine is considered by many as a staple of the Mediterranean diet. If drunk in small doses and provided it is natural and well made, wine is good for the health, especially to keep arteries healthy.